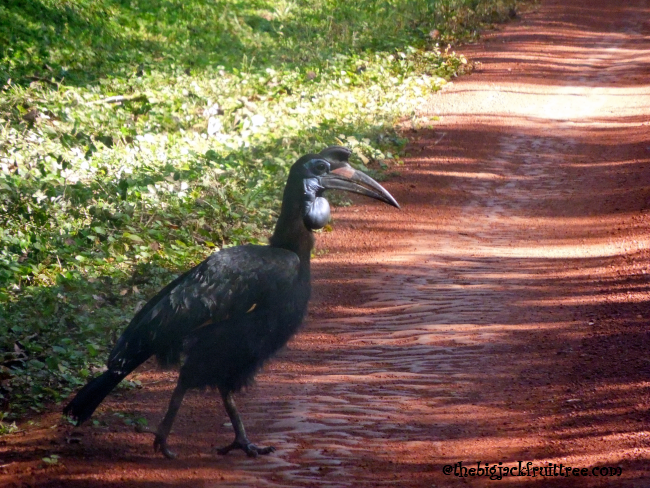 When we talk about birds, the Abyssinian Ground Hornbill is one bird that has fascinated me ever since I first saw one at Murchison Falls National Park, many years ago. Since then, I have seen these beautiful birds a number of times on subsequent trips to Murchison and they always make me smile. Hornbills are generally sedentary and live within a defended territory. 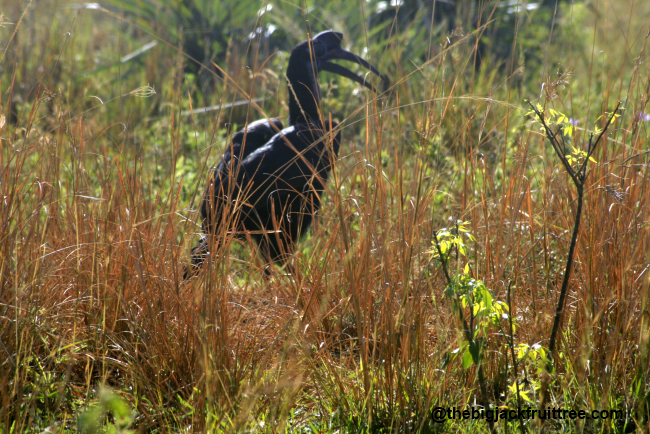 The Abyssinian Ground Hornbill is a large turkey like bird that is normally found in the sub-Saharan African savannah, north of the equator. An adult bird can grow to around one metre tall and weighs about 4 kg. It has a large bill topped with a casque, a helmet like structure. 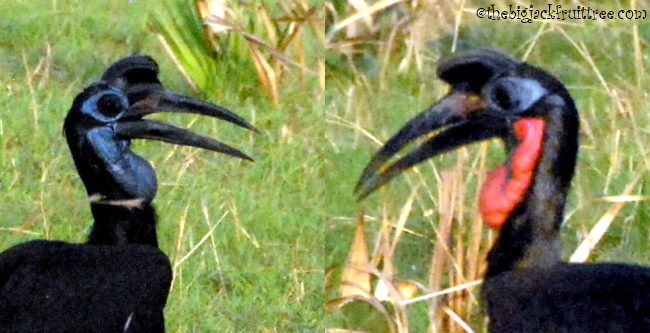 Despite their wingspans these birds very rarely fly and are adapted to ground dwelling, hence the name Ground hornbill. 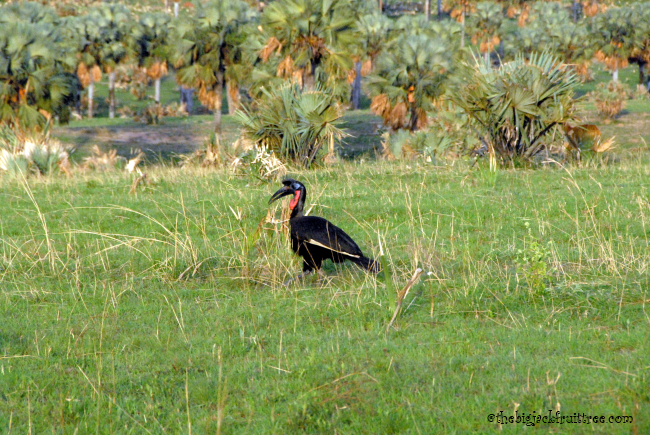 Abyssinian Ground Hornbills also have wattles (a fleshy pouch hanging from the throat, similar to a turkey or chicken). From these pouches, one can distinguish between a male and female bird as males have a bright red pouch hanging from their throats whilst those of females are blue. These birds always seem to me like they are dressed up for a fancy party not only because of their dark , shiny feathers and brightly coloured pouches, but also their long eyelashes, which are actually modified feathers designed to protect their eyes from dirt and debris. I learnt many interesting things about these birds from a Uganda Wildlife Authority guide who had accompanied us on our game drive in Murchison Falls National Park. He told us that the Abyssinian ground hornbill mated for life, which is interesting but one hears that about a lot of birds. What was most fascinating (for me at least, not sure about the others with me!) was finding out about how these birds lay eggs and look after their young. In the case of a regular hornbill, the female lays eggs in the cavities of tree trunks or any other caves or crevices of a tree. The male hornbill then builds a cover over the cavity with mud and twigs and the female does not leave the nest until the eggs are hatched. Naturally, it is the duty of the male bird to bring food for his partner during this time. So if something were to happen to him while he was out fetching his bird wife food and he gets killed, the female will also die of starvation. 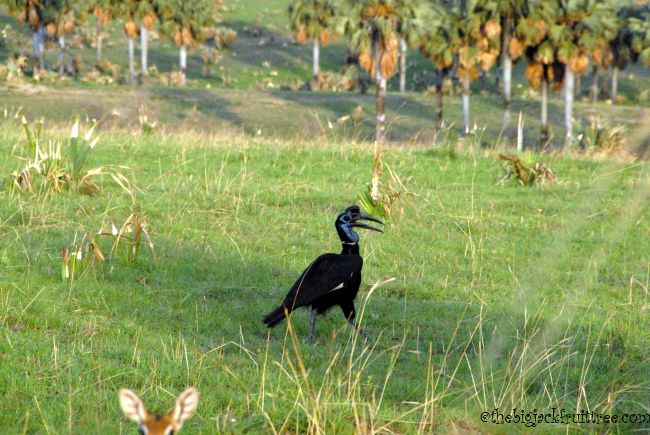 But Abyssinian Ground Hornbills do this in a slightly different way. They do not seal their nests at all, and they are left open during incubation so the female can come out for preening and excretion. Not for anything else though, the male still has to bring food back to the nest. Once the eggs are hatched, the female remains in the nest with the chicks for a week and then joins the male in finding food for the young. If there are two chicks the younger one is usually ignored or starved. Chicks are ready to leave the nest after 3 months. These nests are normally permanent under favourable environmental conditions.